Kiersten Edda Haub, 17 months old, said "Dada" for the first time on Sept. 11. She seemed to sense the tension in the living room as her mother, Erika Haub, and some friends gathered in front of the television. 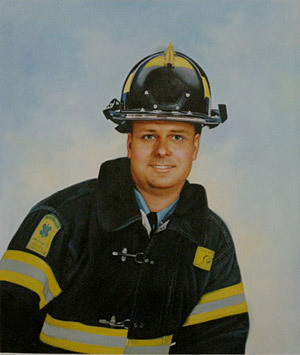 They did not expect "Dada" — Michael H. Haub, 34, a New York City firefighter — to come back home. As she called out to her father, the little girl pointed at his picture. "I was like, 'Oh, my God, she has never said that before,' " Mrs. Haub recalled. Kiersten, who was 15 months old at the time, has been calling out to him ever since. It is not surprising: he was a dedicated father, who had a 4-year-old son, Michael Andreas. As much as Mr. Haub gave to his family, he also gave to the job. He was a member of Ladder Company 4 in Midtown, one of the busiest in the city. Being an only child, he enjoyed the camaraderie of the firehouse. "He liked helping people," his wife said. "He was happy to be at such a busy house because he really wanted to be working all the time."